Marina, that is a great idea for a post! There are so many perfumes that I meet, that evoke wonderful imagery, or are very interesting, or whatever, but that I can't make a decision about---I just teeter around them for a while. I have a problem with a lot of vintage scents (instant or otherwise), in that I get headaches easily from them. But I love hearing other people lovingly or longingly declare their devotion. I'm just not "that girl" that can wear and get away with them. Maybe I am overly modern. Perhaps I am from the future, I can't be sure. Vintage is the theme of an event I am organising in Moffat, Scotland on April 16: the launch of the reissue by Persephone Books of 1930's best-seller 'Miss Buncle Married' followed by a talk on vintage clothes by Edinburgh-based style guru Lynne McCrossan ('A Girl's Guide to Vintage')and a bring and buy vintage clothes bazaar culminating in a retro tea party - all at the Moffat House hotel. Do come!! And bring your Caron Nuit de Noel!! I love that post! It is almost exactly what I feel about Nuit de Noel. You captured it perfectly in the phrase "Instant vintage".I love the image too, fits perfectly. Just this morning I sprayed some Nuit de Noël on my overcoat and I know exactly what you mean, when you speak of its fleeting beauty. As I read your description I instantly went "By jove, I think she's got it!" I am so glad I managed to put a finger on it, so to say. It's been bothering me for years! Marina, you have captured the essence of Nuit de Noel perfectly. Meaning you decided you don't need to capture it. I, too, have been 'confused,' for lack of a better term, about this perfume, and fumble around trying to describe it. I want to love it, but Nuit de Noel is resistant to my affection. Still, I like observing from a distance. Maybe time will come too. Or maybe, like Shelley wrote in her post, it is one of those that should be smelled offskin? Lovely post! I also feel that revisiting vintages can sometimes throw into relief the things that are gone forever, like ingredients or bases. A rather bittersweet experience. Definitely bittersweet. But I sort of like that feeling. The name Nuit de Noel has always turned me off. I can't help thinking of firs, mulled cider, clementines and smoke from a fire which isn't like the scent at all. I've always known I should give it a chance. After reading your post I think it just may be time! I adore the idea of "olfactory dust," thank you for that. When I first started sniffing vintage perfumes it took me awhile to find one that I could really smell at all--too much dust! But then I learned to smell through it, or around it, somehow. And now, as you say, it is part of the experience. Definitely part of the experience and the charm! Marina, I'm such a slacker, I've never smelled this. I hang my head in shame. 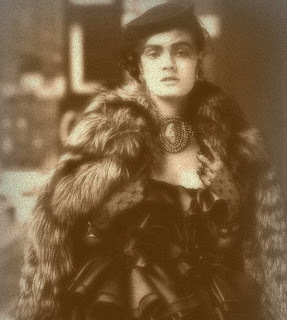 And you have it exactly right about vintage perfumes/antique photographs/tintypes/daguerrotypes. I really treasure my 70+-year-old perfumes, like I treasure the antique photos of my family. There are so many classics I am slacking about...easy to fall behind with so many new releases being churned out. Beautifully written, Marina. I love the Pablo Neruda quote you chose: it's a fitting quote for a number of the Caron fragrances I've smelled. They very much have that sensibility about them. Thank you! And I agree about Carons. They are old souls. Not all "old" fragrances are. Years ago, and the beginning stages of my perfume mania, I bought a bottle of Nuit de Noel off 'bay, unsniffed. I wanted to gag. I quickly swapped it away. I finally re-acquired a sample of Nuit de Noel (non-vintage but still has that old world quality to it) and I'm really enjoying said sample. I don't think I'd need a FB, or even a large decant, but I appreciate it's spicy, vintage softness...instantly! Marina, that's it exactly! It's like the Platonic ideal of what a "vintage" perfume should smell like. I have some of the very old stuff and it's marvelous. There is no way it possibly be mistaken for anything modern. Ah, Marina...that patina that immediately transports a something from the point of entry to another space...I love what you have conjured. As I have not smelled current Nuit de Noel (! I know), I am rolling with the picture you present me with. And I get it. Am trying to think, what other scents I could pick up off a perfume counter now would immediately acquire that patina...Chanel No. 5 almost seems an irony in that respect, as it was so different at the time (I imagine) that it registers as "correct" now. A regular glossy, that one? As usual, I enjoy coming here and being in your moment, whatever (and whenever ;) ) that is. what an interesting topic! the textures so to say. No 5 is definitely glossy, for me. I can also relate to the teetering, both with Nuit de Noel and Parfum Sacre and a number of other Carons - I have had trouble "getting" the whole house, in fact - which is not the case with the vintagey end of Guerlain, say. I have never figured out the reason for this. Meanwhile, you have inspired me to dig out my NdN sample from an equally chaotic drawer and see if I might teeter right over into its camp next time! I do like chestnuts, after all. I would love to read your post on how it goes :) yes, I don't know what's up with Carons either. Guerlains are easier somehow. What a beautiful post. I love the quote by Pablo, so perfectly fitting. Love your analogies, from dust to lamb and vintage photos. Thank you so much, it's very kind! "austere, peaceful and contemplative-- an accompaniment to one's inner private thoughts in the midst of rejoicing." That is such a great interpretation! i am a freak for Nuit de Noel..I'm never without it both the vintage and the modern. I love it. My rule though..although recently I've broken it ,is that its my December perfume. (yes I know how cliche' that sounds) It keeps it special for me though in a way that I love!